The most complex part of your automatic garage door system is the opener. This unit does more than just lift and close the door; it houses many of the safety features that prevent accidents from occurring, as well as the operating system that lets you easily operate your garage remotely. Many modern openers are even more complex, with WiFi connectivity and smart features that allow for even more convenience and security. This can make it difficult to diagnose problems when they arise, but our technicians are experts at identifying and resolving every issue that can potentially occur. Our team has the skills and knowhow to fix problems with openers of every make and model, as we've been working in this field for over a decade, and have encountered every possible issue that such a motorized unit can experience. From broken drive gears and faulty circuit boards to misaligned safety sensors, our team is always able to provide a fast, effective solution to your problem. We always carry replacement parts with us, so if any component needs to be swapped out you won’t be kept waiting - we can usually install a new part right there and then. Our team does more than repair openers when they malfunction. We also provide professional installation services for new units, supplying and fitting opener models from top brands like Genie, Chamberlain and LiftMaster. It can be difficult to know which model is right for you, but don’t worry - you’ll get plenty of expert guidance from our team. We'll make sure you take everything from the noise and horsepower output to the special technological features into consideration before making a decision. In order to keep your opener working at maximum efficiency, we strongly recommend scheduling regular maintenance appointments with our technicians. This allows us to lubricate moving parts to ensure smooth operation, to check for any signs of wear and damage and to make sure the safety sensors and auto-reverse mechanism are functioning correctly. This helps to avoid all sorts of preventable breakdowns by catching problems while they’re still relatively minor, and is a great way to extend the service life of your opener. If you’re searching for a fast and reliable repair service for your opener, or are looking to have a new unit installed, our team can help. All you need to do is call our experts at Garage Door Repair San Ramon today or use our online system to schedule an appointment. 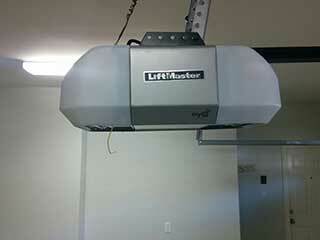 Do you have some LiftMaster garage door opener troubleshooting tips? LiftMaster equips their garage door opener models with self-diagnostic tools that help their owners figure out what’s wrong and how to deal with the problem. Your owner’s manual should have an index for different signs and their intended meaning. If the problem doesn’t appear in that index, or if it’s a complex one that deems a professional’s assistance, our technicians will gladly give you a hand. Which brand garage door opener is best? There are many brands of garage door openers available, but if you are looking for a top quality model with a number of security and safety features then you are sure to find one from brands such as LiftMaster, Chamberlain and Genie. These companies offer some exceptional features over many models and tend to also include smart technology. Want to learn more? Contact us to have an expert help you find the perfect electric opener for your needs.